Istanbul is growing commercially serving as a vital connecting hub between Asia and Europe. Qatar Airways is responding to the increased demand for its services to Istanbul by announcing an addition of three weekly flights to Istanbul Sabiha Gökçen Airport making the route daily, commencing October 26, 2014. The non-stop four-flights-a-week service from Doha to Istanbul Sabiha Gökçen Airport was initially launched on May 22nd this year, marking Qatar Airways’ expansion to its third route in Turkey. The airline currently operates to three destinations in Turkey - Istanbul Sabiha Gökçen Airport (four-weekly-flights), Istanbul Ataturk Airport (10-flights-a-week) and Ankara (four-weekly-flights). With the additional flights from Doha to Istanbul Sabiha Gökçen Airport on October 26, the number of flights to Istanbul rises from 14 to 17 frequencies each week. Turkey’s tourism industry has experienced a recent upward surge and Istanbul is growing commercially serving as a vital connecting hub between Asia and Europe. Now, passengers to and from Istanbul will have better connections across a number of routes in the airline’s extensive network of global destinations including popular destinations such as the UAE, Saudi Arabia, Bangkok, the Maldives, Bali, Singapore, Melbourne and Hong Kong. 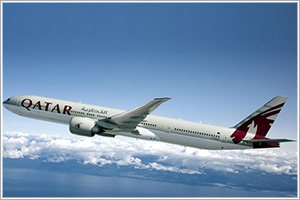 Qatar Airways, the State of Qatar’s national airline, has seen rapid growth in just 17 years of operation, to the point where today it is flying a modern fleet of 135 aircraft to 144 key business and leisure destinations across Europe, the Middle East, Africa, Asia Pacific, North America and South America.